The home of today’s Dr. Ing. h.c. F. Porsche AG, Stuttgart, has a very special sound in the world of motoring: Zuffenhausen. Indeed, Zuffenhausen is far more than “just” a production plant rich in tradition for Porsche AG, since it is in Zuffenhausen that the 'heart' of the Company beats to this very day. Zuffenhausen has been Porsche’s home address for more than 70 years and more than one million Porsche sports cars have been built there since 1950. The Porsche Design and Construction office moved from Kronenstrasse 24 in downtown Stuttgart to the new group of buildings in the District of Zuffenhausen way back in June 1938. 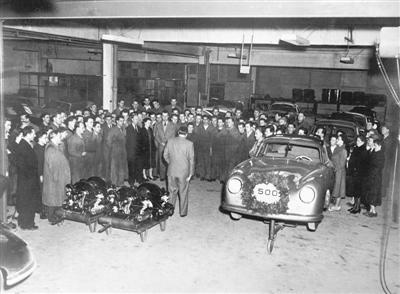 Right from the beginning, important chapters in the history of the automobile were then written in Porsche’s home plant: This is where the first series of the car destined to become the Volkswagen Beetle was built in 1938, followed in 1939 by the Type 64 as the 'great-grandfather' of all Porsche sports cars to come in later years. Originally planned for the Berlin-Rome long-distance race, this aerodynamic, highly streamlined sports car became the trendsetter for all Porsche models to follow. After the first few units of the Porsche 356 had been built in the Austrian town of Gmünd as of 1948, Porsche returned to Stuttgart as a genuine “car city” in late 1949. With the Porsche Plant in Zuffenhausen still being occupied at the time by the US military, Porsche first rented a production hall on the premises of the nearby Reutter & Co GmbH Coachbuilding and Body Construction Plant, starting to prepare production in early 1950. With the first Type 356 being completed in Stuttgart on 6th April 1950, overall production up to the end of the year amounted to 369 units. The success of Porsche’s sports cars is borne out clearly not only by the Company’s sales figures, but also by the further expansion of the production facilities in Zuffenhausen. 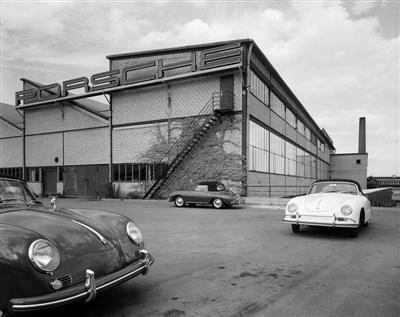 The buildings forming Porsche Plant 2 designed by the well-known architect Rolf Gutbrod were completed in 1952 and in 1956 the 10,000th Porsche 356 left the plant. The factory had been consistently enlarged and upgraded over the years. 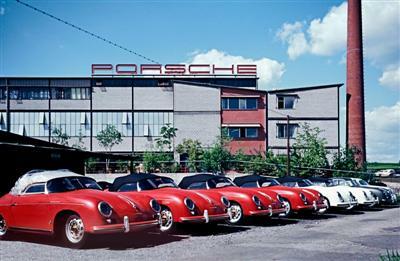 Porsche Plant 3 followed in 1960, also housing the Sales and Customer Service Departments. Immediately after the introduction of the Porsche 911, Porsche KG, as the Company was still called at the time, took over the Reutter Coachbuilding and Body Construction Company in 1964 with its workforce of approximately 1,000 employees. Today, the complete 911 model series as well as models of the Boxster series and all Porsche engines are built in Zuffenhausen. The new Porsche Museum was opened in January 2009 as an additional pledge to Zuffenhausen. Here, virtually on the Company’s home ground, some 80 historical cars and exhibits from the history of the Company are presented in an exhibition area of 5,600 square metres (60,200 square feet). As the most spectacular building project commissioned by Porsche, the Porsche Museum has not only gone down in the history of the Company, but also enriches the entire Stuttgart Region as an outstanding highlight in culture and architecture. The Porsche Museum is honouring the 60th anniversary of Porsche in Zuffenhausen with a special exhibition: The beginnings and the ongoing development of production at Zuffenhausen are being presented by a series of photos in this exhibition from 20th March to 9th May 2010. A further highlight is the first Porsche 356 Coupé built in Zuffenhausen will be shown for the first time in the Museum follow an unusual restoration process. The Porsche Museum is opened Tuesdays to Sundays from 9:00 to 18:00.